Want To Want Me-Jason DeRulo | Wedding Wisdom, Etc. being more than a sensational song-of-the-moment. Yet… there’s a playful sincerity to DeRulo’s best songs, including “Want To Want Me.” What makes this video particularly fun to watch as well as listen to is its split-screen format, with the vocals pouring in from country music superstar Luke Bryan, who looks like he’s having the most amazing time, just being a part of it all, trying to keep up with Jason’s “Prince-like” falsetto.This is a song to be enjoyed, and to dance to, rather than be analyzed for its musical complexities nor its fairly inconsequential lyrics. “Want To Want Me” is everything it’s supposed to be, a flat-out fun dance song. Enjoy. I tip the driver, head to town. Give me the best. I got your body on my mind, I want it back. Great, fun, can’t-miss dance song. 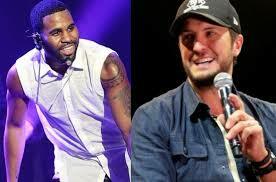 Congrats to Country Music superstar Luke Bryan for being game enough to attempt a duet with the soulful Jason DeRulo. He more than holds his own. Leave me a comment to let me know what you think!